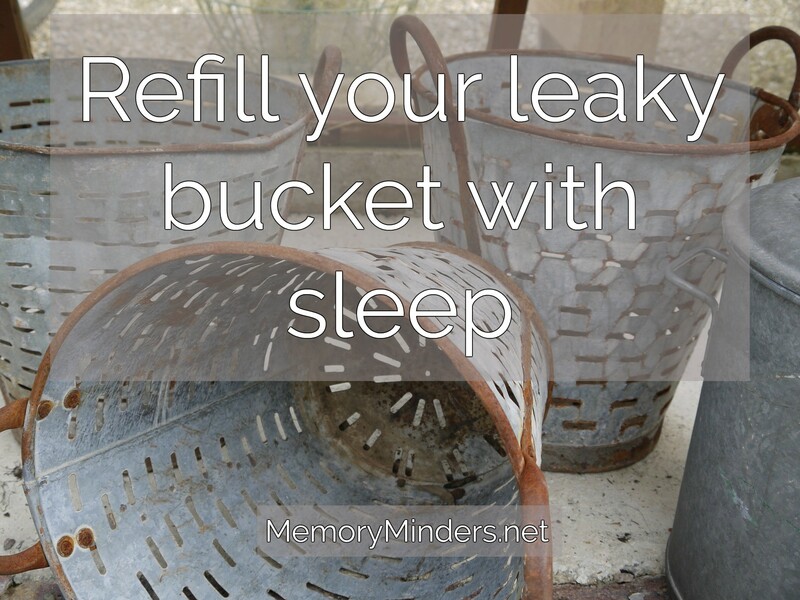 Ever feel like a leaky bucket? We finally catch up and another urgent need screams for attention. It may be a project, necessary tasks like laundry or grocery shopping, a person in our care-professionally or personally or just even our own body crying out for attention. Continually giving of ourselves without refilling will empty our leaky buckets. Whether we care for a loved one long-distance, provide hands-on care professionally or personally or juggle aging parents and raising kids, we are caregivers. Taking care of our own wellness is just as important as taking care of those we serve. But too often our own wellness comes last on our lengthy lists. Always putting others first without addressing our own wellness can lead to burn out, fatigue, and even our own health issues. Continuing last week’s suggestions on how to manage Caregiver stress, let’s talk about one of the most important components of mind and body wellness-sleep. Caregivers often don’t get adequate, restful, uninterrupted sleep for any number of reasons. Listening for loved ones who need assistance or wander during the night, staying up late or rising early with small or teen children, or using sleep time to catch up on other tasks all add up to poor quality sleep. The answer is simple but yet eludes us for various reasons. We need to get a sufficient quantity of quality sleep. Easier said than done. We can deal with less sleep if it’s a short-term issue. But when a short-term issue impacting sleep becomes a long-term problem, it’s time for some changes. Get nighttime help. It may seem like a waste of money to pay someone to sit or be present with a loved one while they sleep, but it is an investment in everyone’s quality of life and health. Take turns with family, barter for something easy to do during the day with someone to help at night or hire non-medical help, but somehow, someway get assistance. If sleep is continually cut short, interrupted or decreased due to caring for someone during sleeping hours, a new nighttime plan is needed. Get daytime help. Often what interrupts our sleep may not occur during the night. Daytime responsibilities often overflow into sleep time for caregivers. Addressing all that’s on our plates and eliminating, delegating or shifting some of the workload may improve sleep quality or quantity. We may need to say no to someone or something to say yes to better sleep. Address time management. I try to pay close attention to how I manage my time, yet whole hours go by without getting anything done! Necessary tasks then get pushed into sleep time. It’s a mystery solved only by assessing how much time things actually take. I allow 30-60 minutes to grocery shop when in reality; the full task is much longer. By the time I travel to/from the store, shop, and put it all away in an organized fashion, it can be up to 2 hours! This non-accounted time overflows into the rest of the schedule and it’s another late night. Assessing workload and realistic, available time is the key. Then, make any necessary changes to allow for better sleep. Make sleep a priority. At some point, we all need sleep. Pushing sleep down the priority list really doesn’t help anyone. Sure, staying up late or getting up early checks things off the list, but mind and body wellness suffers in the end. Let’s put a period or a placeholder in what we can and move sleep up the priority list. See it as a deadline we don’t want to miss. Only when viewed as a priority will we make it one. These are just a few strategies we can employ to make sleep a priority in our lives. Sleeping well refuels and refills with a myriad of physical and mental benefits for both caregivers and those we serve. 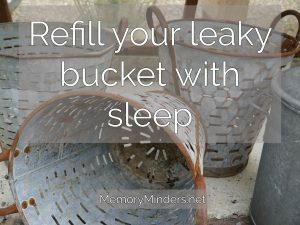 Let’s allow our care to flow from a fully rested bucket by sleeping well. HI jill, i’m your next door neighbor at anita’s blog BLESSEDBUTSTRESSED. nice to meet you and find your blog:) my husband has had 1 stroke and a couple years later had 2 smaller strokes shortly after having pneumonia. he is doing pretty well now. i am a retired RN. The difference in caring for others and caring for our family can be daunting, I agree. But caring for ourselves in the middle of it becomes so important as we care from a full and not leaky or empty bucket. Thanks for stopping by Martha and blessings on your journey! These are excellent suggestions, Jill! Thank you so much for sharing them at the Caregiver Connections link up :). During my first caregiver journey, I thought I had to do it all, so I suffered from sleep deprivation. It wasn’t pretty. During a short-term crisis (or at the onset of a crisis–like a cancer diagnosis), people are eager to help out. That’s when I should have accepted offers and scheduled people to do things for me–before I got behind! Yes, it’s always so hard to accept help but when we view them as the gifts that they are, we can accept them graciously and with the love they’re given ANC help ourselves and those we’re caring for as well! Thanks for all you do for caregivers, Anita! Great list of suggestions, Jill. Thanks for linking up at http://www.blessedbutstressed.com!